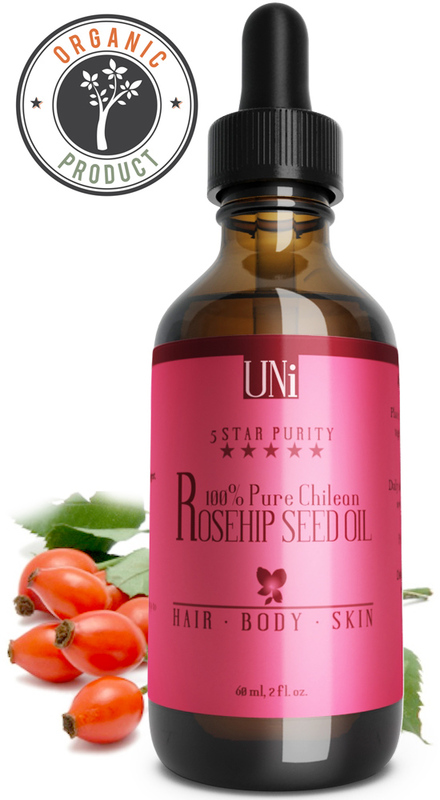 I just tried out Uni’s 100% Rosehip seed oil and I love it. You can use this for a variety of things. It’s a very well made product, genuine 100% rosehip. This is a great product full of healthy elements for your skin & hair. It comes in a glass bottle that keeps it fresh and a dropper that you can use to get the perfect amount every time. It really only takes a drop or two to get the benefits. I’m not a huge fan of the smell of rosehip but I love using it in lotions and other homemade products that have fragrances I enjoy so I can still get the health benefits from the rosehip with a pleasant smell. Great product. PREMIUM INGREDIENT 100% CERTIFIED USDA AND ECO CERT ROSEHIP SEED OIL. NO ADDITIVES OR FILLERS. Imported and sourced from their natural environment in Chile, bottled here in USA. 2oz/60ml. Super fine, easily absorbent and does not leave behind any oil residue. Non-greasy and super light. Leaving your skin feeling soft and look radiant. Multi-purpose oil for all skin types that promotes healthy skin and hair care. Use alone or in conjunction with other daily moisturizers. Treats winkles, scars, stretch marks, rashes, burns, acne, dry skin, dermatitis, age spot, brittle nails, psoriasis, eczema, hyperpigmentation, sun damage, dry and damage hair, and anti-inflammatory. NOURISH YOUR SKIN FOR A HEALTHIER AND SMOOTHER TONE. LOOK RADIANT AND BEAUTIFUL ALL THE TIME! SATISFACTION GUARANTEED. TRY IT RISK FREE TODAY! SEE AMAZING RESULTS WITHIN DAYS. NO HASSLE MONEY BACK.